Have you ever eaten Cadbury Dairy milk chocolate? If you haven’t you must go try it. It is my favourite chocolate. So if you haven’t seen or heard of cadbury chocolate you might wonder why this colour purple is called Cadbury. Well the name speaks for itself, the packaging of cadbury chocolate is similar to our cadbury purple bridesmaid dresses. 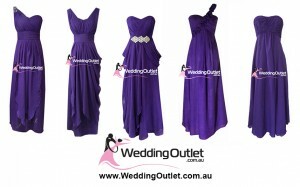 Cadbury purple bridesmaid dresses is a royal type of colour and also slimming. Purple appears to be every girls favourite colour, so for those that want a slimming figure as well as incorporating purple in their wedding theme then this is a nice colour to go with. You can mix and match if you see another style on our website, we can also make it in this cadbury purple (amethyst purple) colour.